When I was young and stupid, I had a lamb incident. Not unlike a moon-eyed freshman at her first college keg party, I did not yet know my limits with lamb, and as an enthusiastic eater I was an easy target. It was the summer of 2003, and I was the “and-one” guest at a lovely rural wedding. There were many culinary highlights to the evening, but the one that seemed to capture my fancy at the midnight hour was a caterer-sized aluminum pan of leftover grilled lamb. I’ll leave the story at this climactic precipice and present a moral: a lamb is a small creature, and thus should be eaten in moderation. The result of this little affair was that I didn’t eat a whole lot of lamb in the years that followed. Nor did I figure out how to cook it. However, this being the 10 year anniversary of the lamb incident, I felt it was finally time to dust off the relationship. My opportunity presented itself in the form of Evan Mills, head butcher at the Rosemont Market on Brighton Street. He offered to walk me through the steps of butterflying a leg of lamb, which we would marinate and grill. Our plan was to package up the finished product into reasonable sized portions, and bring it to the Portland Food Swap along with some tzatziki, which I would make at home. It was an exciting moment for me, stepping behind the butcher’s counter. While this might be commensurate for some with getting to walk the set of their favorite T.V. show, for me it was right up there with a visit to the It’s It ice cream factory, or a week touring Cognac cellars in France. Okay, so maybe not quite up there with the Cognac cellars, but I did honestly enjoy checking out such a familiar scene from a new perspective. While other butchers doled out pork chops and marinated chickens to wanting customers, Evan demonstrated how to butterfly a leg of lamb. Our cut, a Katahdin Breed, came from Crystal Spring Farm in Brunswick, and was entirely pastured on pesticide and herbicide free grounds. My question as to whether or not the Katahdin was a local breed was answered by the Crystal Spring website, where I learned that it is a “composite that was developed in Maine in the 1950′s from African hairsheep crossed with several Down (large framed English) varieties.” The breed is favored for its fertility, among other traits that make it ideal for lamb production. As Evan got to work removing a flap that would be saved for sausage trim, I asked him about lamb fat. 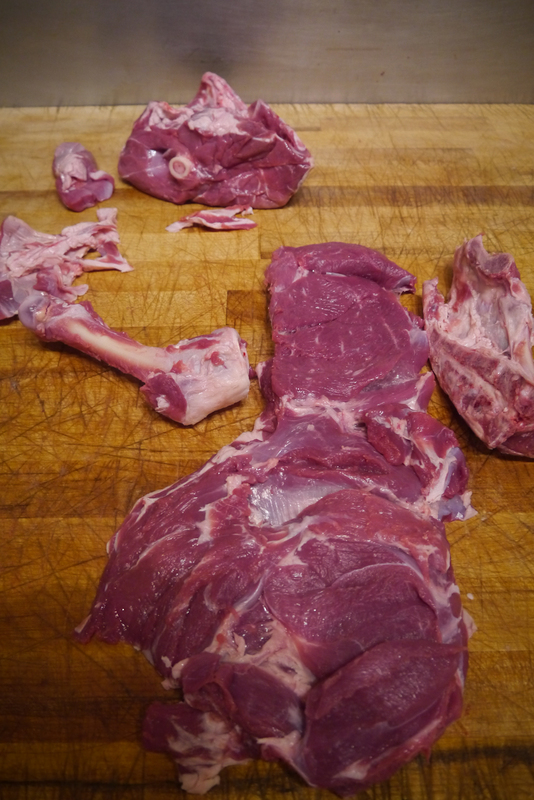 I never fully understood how to determine which fat should be removed, and which should be saved when cooking lamb. He pointed out an small section of fat sitting near the aitch bone (sounds like “H” bone, this is the lamb’s pelvis). It had a slightly tougher, more globule-like appearance than the fat that striated the meat. While there wasn’t much of this kind of fat on our pastured lamb, this was the unctuous fat that, similar to the leaf lard from a pig or suet from a cow, Evan would remove. Evan expertly made his way around the cut, removing the aitch bone and femur. In the picture below, you can see all the pieces: moving clockwise and starting at 12 o’clock, is a full, bone-in leg, then the aitch bone around 3 o’clock, followed by the our butterfly-cut lamb leg, the femur, and finally trim for sausage at 10 and 11 o’clock. At this point the lamb was ready to marinate. Evan whipped up a marinade with olive oil, balsamic vinegar, thyme, rosemary, and garlic, in which it would rest overnight. We planned to grill and package it up for the Food Swap the next day, so I headed home to make some tzatziki. If you think the most challenging thing to capture in a photo is a moonlit beach, group of speeding racehorse, or an ugly baby, you’d be wrong. It is tzatziki. If you doubt me, just go on a quick Google search, and be amazed at the blandness. It turns out that lumpy white yogurt does not make for flattering photography. As I researched recipes, I became fascinated by people’s attempts to make this product visually appealing. Many took the approach of a tilted close-up, an kind of action-shot theory that makes the yogurt spread appear all the more sedentary. One blogger painstakingly photo documented each step of the process, in case one needed visual cues for what blended cucumber looks like in a Chop Master. All boring, but only one was repulsive: Ina Garten’s version, featured in a gelatinous, yellowy extreme close-up. But do not be fooled by tzatziki’s blase appearance and simple ingredient list. It is a great way to brighten a dish, and was a natural partner to our grilled lamb. I chose to use full-fat (10%) plain Greek yogurt for mine, both because I think full fat tastes better, and also to stand up to the richness of the meat. I noticed that many recipes called for a wine vinegar, while others called for lemon, so I used a bit of both for mine. I also found discrepancies in herbal contributions, and while I think that most any fresh herb would taste good in the spread, I decided that a combination of dill and mint would be best suited for the lamb. While any cucumbers can be used, I always favor fresh little ones, which I can find locally year-round (Olivia’s Garden typically has baby European cukes at farmer’s markets and shops around town even in the coldest winter months). For this batch I got pickling cukes from Farmer Ben at Meservey Farms which worked quite nicely. 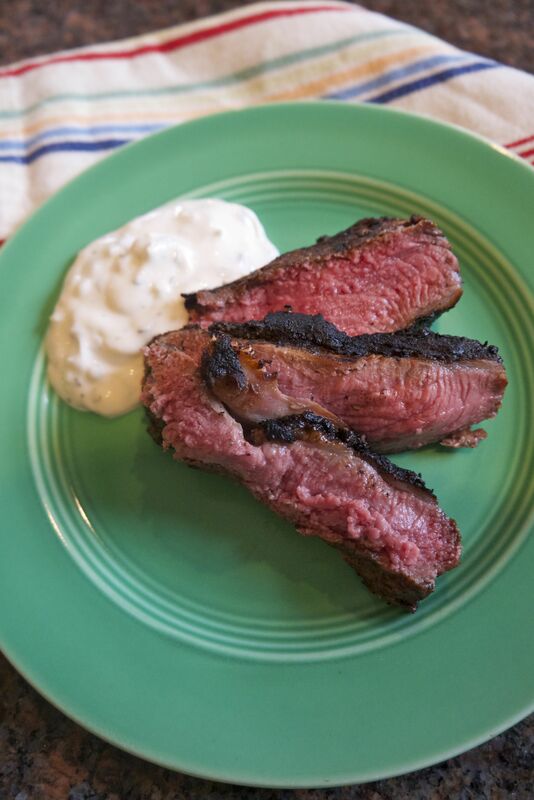 I have included a detailed recipe for the tzatziki at the end of this article. The next day I returned to Rosemont during my lunch break to grill up our sweet little lamb. 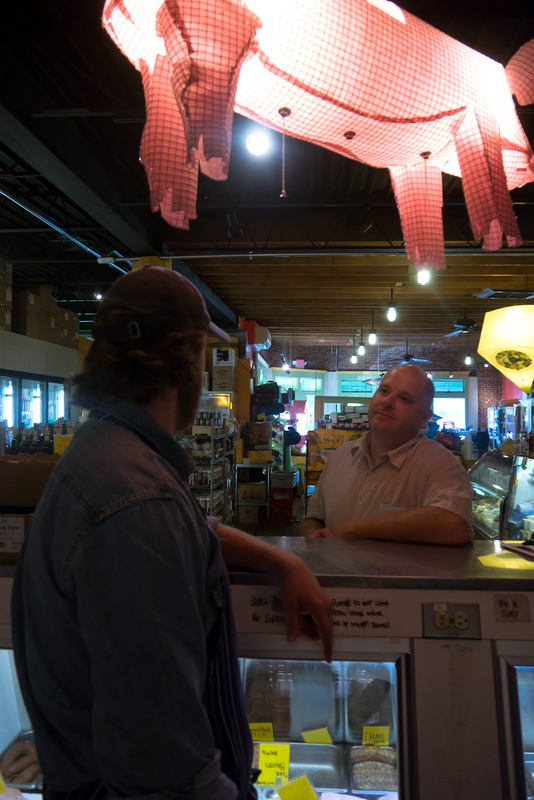 I met Rosemont butcher Matt Saunders, in the back, where he and Evan had a charcoal grill going, nice and hot. 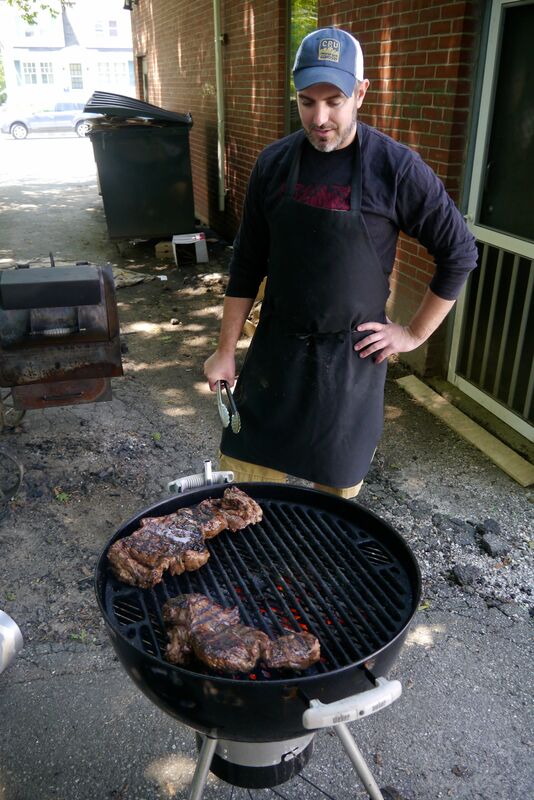 Evan had invited Matt to take the reins since, after 16 years in the restaurant industry, he’s a man who seriously knows his way around a grill. Indeed, he handled the meat with expertise, flipping and moving it around to ensure that the heat was evenly distributed throughout the cut, which was far from uniform in thickness and width. Since he couldn’t move the coals around beneath the grate, he utilized all edges of the grill, particularly before the coals began to cool down, and for the thinner sections, as well. We ended up with a lovely golden-brown crust, distinguished with just the right amount of char. Once it had 7 or 8 minutes to rest (thus allowing the juices to take up residence in the meat rather than run all over the place), he sliced off an end for me to taste. Delicious. But as good as it was hot off the grill, I enjoyed a few midday slices, served up with tzatziki, even more. And just as the tzatziki was good on its own, or slathered over a chunk of bread, it really came into its own when partnered with the lamb. A perfect balance of rich flavor and freshness, I have to hand it to the Greeks – they knew what they were doing when they came up with this one. 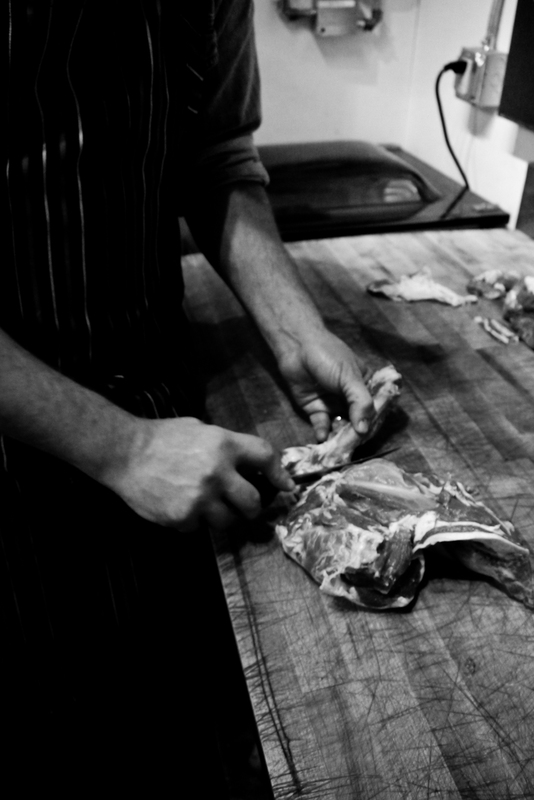 Begin with a butterflied lamb leg. Your butcher should be able to do this for you, or if you want to attempt it at home, some description of how to do so proceeds this recipe in the first part of the article, or a quick YouTube search could give you all the info you need. Prepare your favorite marinade. We used one of olive oil, balsamic vinegar, thyme, rosemary, and garlic. We chose to marinate our lamb overnight; if you do not have the luxury of time, try to at least give it a few hours to marinate. Remove the meat from the refrigerator about 30 minutes before grilling to bring it up to temperature. Get your grill going, ideally charcoal if you have it. When the coals are nice and hot, place the meat on the grill, sprinkle with salt and pepper, and cook to your liking. Moving the meat around, and flipping back and forth between sides will help you to get a golden crust on it with some charring, without burning it. When the meat is done, allow it to rest for about 7-8 minutes before cutting into it, so that it stays good and juicy. Serve it up with some tzatziki, and other accoutrements as you please (tomato, feta, red onion, fresh pita or bread) and enjoy! The following recipe yields about 5 cups of tzatziki; adjust ingredients to suit your needed portions as well as your taste! Start by preparing your cucumber. I used about 5 pickling cukes (4-5 inches in length) which yielded around 1 1/2 cups. The amount does not need to be exact, and can be altered as you like. To prep, peel the cukes, and slice off the tips. Cut lengthwise, and scoop out the seeds. Some recipes I found called for cubed or chopped cucumber, while others called for shredded or finely diced cukes, so I did a little of each – I shredded half with a large cheese grater, and cubed the other half into about 1/4 inch cubes. Next, lay the prepared cucumer out in a fine-mesh strainer, and sprinkle with about a teaspoon of salt (I did two different strainers for the two kinds of cucumbers). Let sit for 30 minutes. Meanwhile, finely dice 2 cloves of garlic. I happened to have fresh scapes, so I used one scape, and one clove. Then finely chop your fresh herbs. I chose to use dill and mint; you could also incorporate thyme, oregano, or any other herb you particularly love. I chopped up about 4 teaspoons of herbs in total, but again, you can alter the amount as you like. Toss your garlic and herbs into a large mixing bowl. To the mixing bowl, add 4 cups of plain Greek yogurt (note: this is the size of one large yogurt container). I chose to use full fat Cabot yogurt, but non- or low-fat yogurt can be used, as well. Add the freshly squeezed juice from a 1/2 lemon, and about one teaspoon of vinegar (wine or cider both work). Mix together the ingredients in your bowl. If it has been about 30 minutes, use a paper towel to press out any extruded water from you cucumbers. Before adding them into your mix, use a dry paper towel to swipe the bottom of the strainer, catching any extra liquid. Once you’ve added the cucumbers to the bowl and given everything a thorough mix, taste to see if you want to make any further alterations to your tzatziki. Note that the salt from the cucumbers will begin to integrate into the mixture after a short amount of time, so you may want to wait to increase the salt.